These three albums are from a series of Gene Ammons-led sessions recorded for Prestige starting in 1955, when the tenor headed what amounted to the label’s house group in after-hours collaborations that, despite their take-no-prisoners approach, yielded much swinging and imaginative excitement. Amid the fierce blowing Ammons displays power and intensity, and Jackie McLean reveals his concern for linear development, exhibiting a warm tone and phrasing firmly based on Bird. Three great trumpet players are featured in these albums. On Jammin’ with Gene, Donald Byrd is in incisive and in arresting form, and Art Farmer is his usual elegant, fluent self, both on this album and Funky, while Idrees Sulieman is lyrical and forceful on Jammin’ in Hi-Fi. Guitarist Kenny Burrell offers some typically fleet choruses on two of the sessions. On piano, Mal Waldron’s spare solos offer some piquant moments and leanly provocative statements, supported splendidly by Doug Watkins’ blues-rooted drive (he is replaced by the powerful Paul Chambers in the last date) and Art Taylor’s intelligent rhythmic patterns. The last three bonus tracks on the second CD come from Ammons’ album The Happy Blues, again with Farmer, McLean and Taylor, but with pianist Duke Jordan instead of Waldron, and bassist Addison Farmer and Candido Camero on conga. 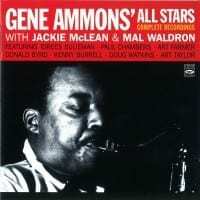 Since the maximum playing time of a CD is 80 minutes, it has been necessary to leave out the track “Can’t We Be Friends?” from the album “The Happy Blues.” It has been added as a bonus track on the 2-CD set “Gene Ammons All Stars” (FSR-798). "Ah! There’s nothing like the big beefy sound of the “Texas Tenor” to cure whatever pains you have. 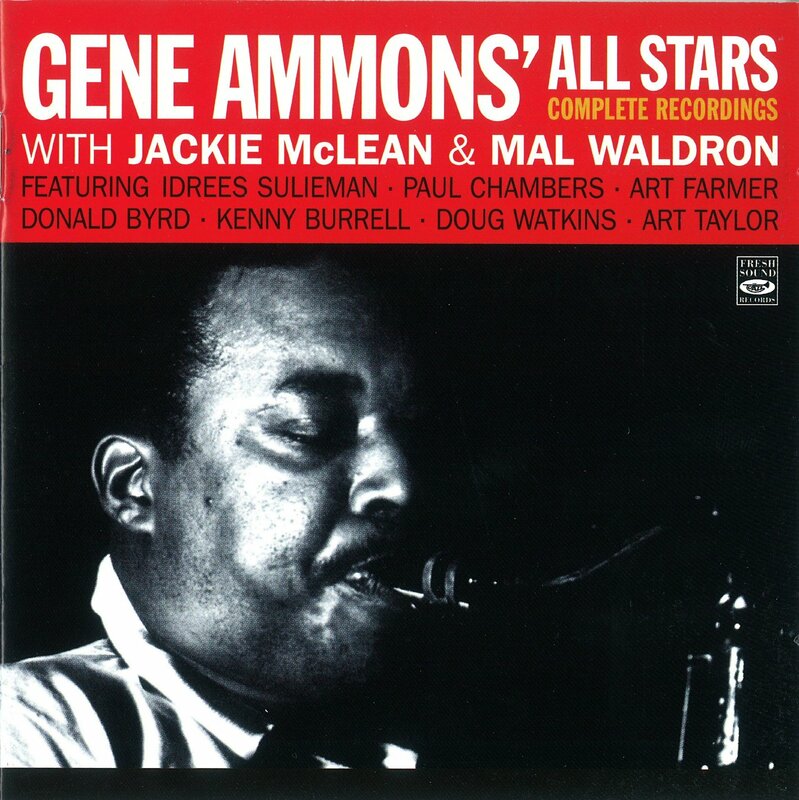 I’m convinced if you could just take Gene Ammons’ tone and make a balm out of it and rub it into your muscles, you’d feel like you had a 30 minute massage. The 1956-57 albums with Jackie McLean include three tunes with the golden trumpet of Art Farmer and Donald Byrd as everyone stretches out on a jam session over a pair of blues and Ammons holding court on an autumnal “We’ll Be Together Again.” Guitarist Kenny Burrell joins up with the band to replace Byrd and contributes some nice work on his title track “Funky” while Jimmy Mundy does some nice arranging of “Pint Size” and “King Size” to keep you alert. MacLean’s bright tone is filled with spice here. The 1957 Stereo Jammin’ session includes the underrated trumpet of Idrees Sulieman, still with Burrell in tow, and they let four songs ride for 11-13 minutes each. A boppin’ “Four” and a sauntering “Pennies from Heaven” are putty in the hands of these giants. Most of the 1956 The Happy Blues album is on this disc, with one track on the other set, with pianist Duke Jordan getting some space on the title track and Farmer glowing on “The Great Lie.” Not a weak nanosecond of sound."